Hay returns to memories of a boyhood divided between Manhattan and the deep woods of Sunapee, New Hampshire, to a time when he knew “one should always be outdoors, with the unregistered and the unsigned.” He writes with precision and beauty of pilot whale strandings on Cape Cod’s Outer Beach—and of the attendant human confusion and greed—and of the sweep of a century in which “our modern, owned world is going deaf from listening to its own answers.” Hay keeps company with Maine barn swallows and finds in the Lakota Sioux Grass Dance a way to listen to the wind. Always, through often uncannily affecting language, John Hay shows us just which ceremonies we all must attend to. 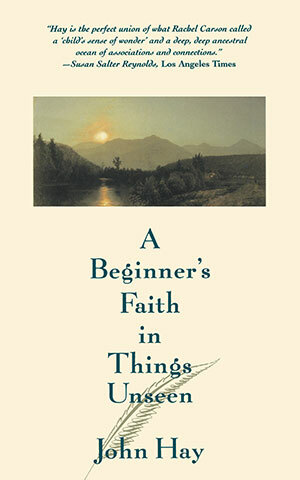 "After a lifetime of study, [Hay] retains the humility and passion of a beginner." "[Hay] believes that we must return to the kind of direct, open, and intuitive relationship with nature that children have....[He] infects his readers with the same sense of wonder and grace." "Dispatches from a lifelong pilgrimage of faith in the endurance and overarching power of the natural world....This is among the finest nature writing you'll ever encounter."